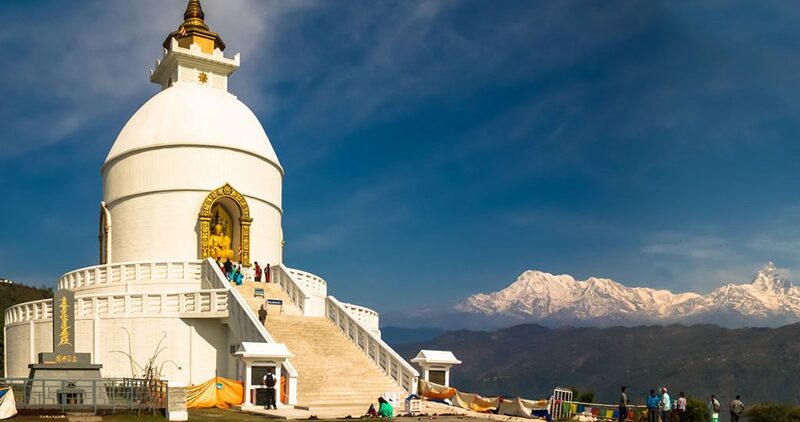 Kathmandu - Pokhara Tour - Blue Mountain Travels and Tours (P.) Ltd. 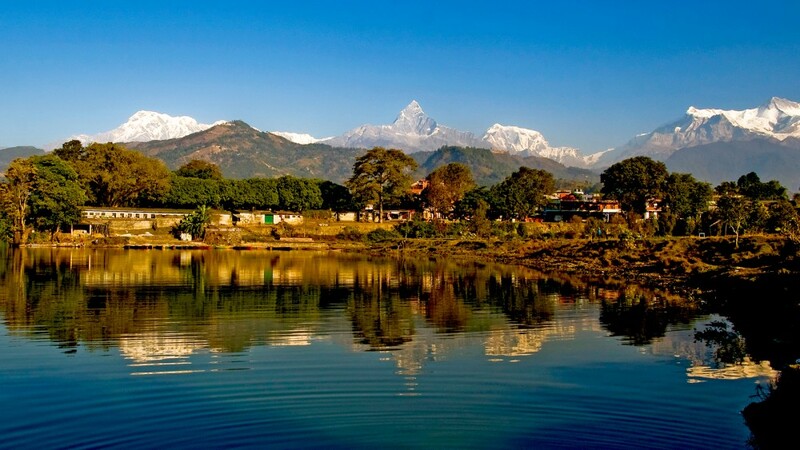 If Kathmandu is the cultural hub of Nepal, Pokhara is its center of adventure. An enchanting city nestled in a tranquil valley; it is the starting point for many of Nepal’s most popular trekking and rafting destinations. The atmosphere on the shore of Phewa Lake is one of excited vitality as hipster backpackers crowd the many bars and restaurants exchanging recommendations on guest houses and viewpoints, both by the lake and above the clouds. Clearly the most stunning of Pokhara’s sights is the spectacular panorama of the Annapurna range, which forms its backdrop. Stretching from east to west, the Annapurna massif includes Annapurna 1 to IV and Annapurna South. Although the highest among them is Annapurna 1 (8,091 m), it is Machhapuchhre, which dominates all others in this neighbourhood. Boastfully levitating in the skyline, the fishtailed pinnacle is the archetypal snow-capped, needlepointed mountain. If you want to see the mountains from close up, Everest Air offers a mountain flight from Pokhara that takes you on an aerial sightseeing tour of the western Himalaya. The Barahi temple is the most important monument in Pokhara. Built almost in the center of Phewa Lake, this two-storyed pagoda is dedicated to the boar manifestation of’ Ajima, the protesters deity representing- the female force Shakti. Devotees can be seen, especially on Saturdays, carrying male animals and fowl across the lake to be sacrificed to the deity. Another of Pokhara’s natural wonder that unfailingly interests visitors is the Seti Gandaki River. Flowing right through the city, the boisterous river runs completely underground at places. Amazingly, at certain points the river appears hardly two meters wide. But its depth is quite beyond imagination over 20 meters! Mahendra Pul, a small bridge near the old Mission Hospital, provides a perfect view of the river’s dreadful rush and the deep gorge made by its powerful flow. Locally known as the Patale Chhango (Hell’s Fall). Devi’s Fall (also known as Devin’s and David’s) is a lovely waterfall lying about two km southwest of the Pokhara airport on the Siddhartha Highway. Legend has it that a trekker (Devin, David.) was washed away by the Pardi Khola and mysteriously disappeared down into an underground passage beneath the fall. Pokhara’s traditional bazaar is colorful and so are its ethnically diverse traders. In its temples and monuments can be seen ties to the Newar architecture of the Kathmandu Valley. Located about four km from Lakeside, the market’s original charm is alive and well. This area strewn with shops selling commodities ranging from edibles and cloth to cosmetics and gold is a pleasant and shady spot to stroll around. The old bazaar is also home to one of Pokhara’s most important shrines’. Locally called the Bindhyabasini Mandir, this white dome-like structure dominates a spacious stone-paved courtyard built atop a shady hillock. It is dedicated to Goddess Bhagwati, yet another manifestation of Shakti. The park-like grounds offer a fine picnic area, and on Saturdays and Tuesdays when devotees flock there to offer sacrifices, it takes on a festive local flavour. The Pokhara Museum, located between the bus stop and Mahendra Pul, reflects the ethnic mosaic of western Nepal. The lifestyles and history of ethnic groups such as Gurungs, Thakalis and Tharus are attractively displayed through models, photographs and artifacts. One major attraction is a display highlighting the newly discovered remains of an 8000-year-old settlement in Mustang. Open daily, except Tuesdays and holidays, from 10 am to 5 pm. Entrance fee is Rs.10 (tel: 20413). Paragliding in Pokhara, you get an view – the turquoise lakes of Pokhara, the mountains and the forests in the Annapurna area. Arrive at Tribhuvan International Airport in Kathmandu. Complete custom and visa formalities. Representative from Blue Mountain Travels & Tours will receive you and then transfer you to 3- star category hotel. Overnight in a hotel. After breakfast, a guide will take you on Kathmandu city tour on a private vehicle. Kathmandu Valley has 7 UNESCO sites and Kathmandu city alone has 4 sites. You will visit Pashupatinath – the holiest Hindu Temple, Bouddhanath- the largest Stupa, Swoyambhunath – the oldest stupa and Kathmandu Durbar Square- the old Royal Residence. Go for shopping in Thamel in evening. Leave hotel after breakfast and drive to Patan Durbar Square. Witness the unique architecture in Durbar and visit Shikhara fashioned Krishna Mandir. Drive to Bhaktapur. 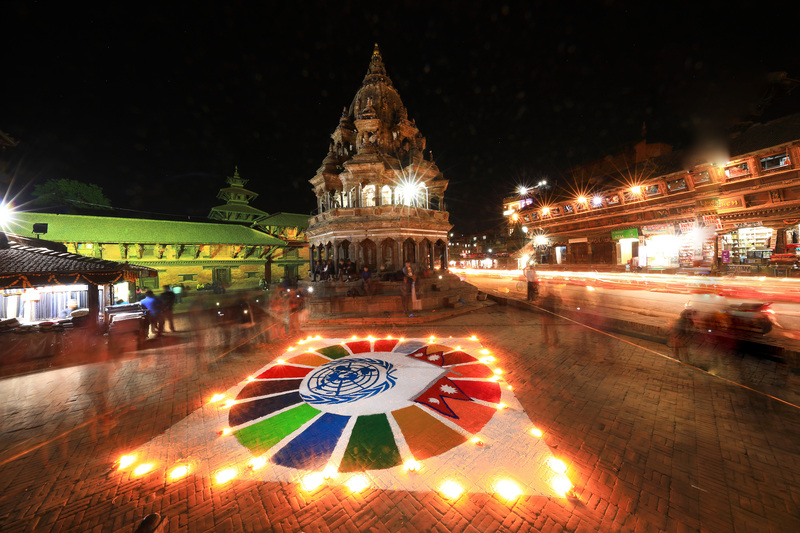 Visit UNESCO site of Bhaktapur Durbar Square. 55 Window Palace, Nyatapol Temple and Golden Gate are some of the things to see in Bhaktapur. Drive to Nagarkot for sunset view. 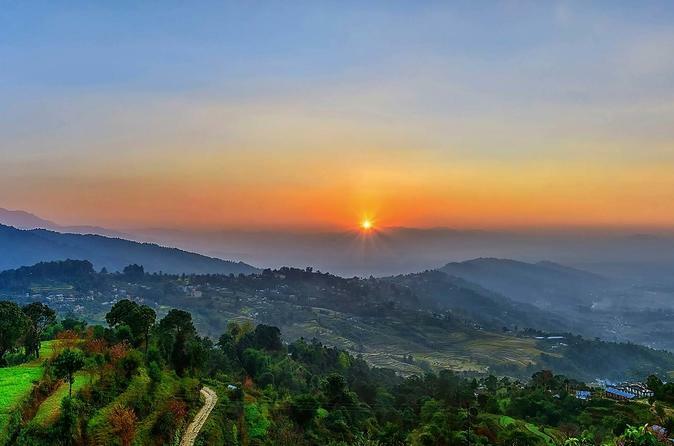 Wake up early in the morning and reach Nagarkot view tower for breathtaking sunrise view over Himalayas. Leave Kathmandu and follow Prithvi Highway. The path will be scenic with views of Trishuli and Marsyangdi Rivers, Annapurna Mountain and other mountains and peaks. Wake up early in the morning and hike to Sarankot for sunrise view. 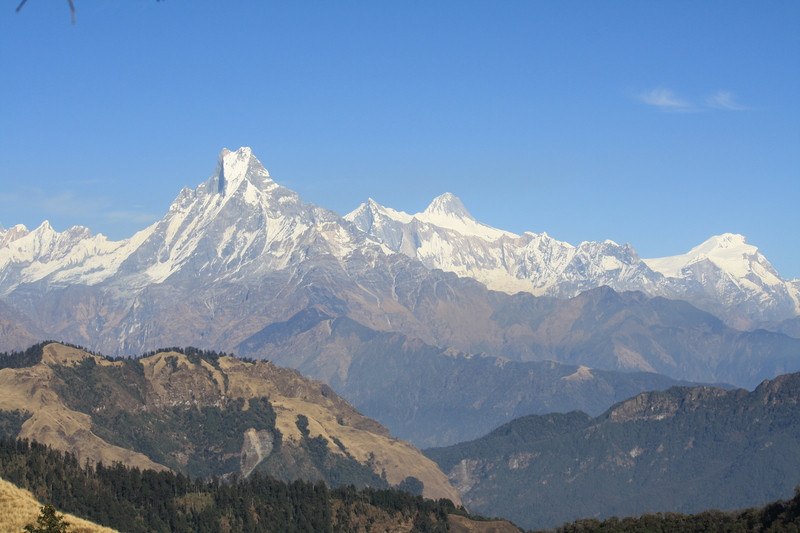 Get close-up views of Hiunchuli, Manaslu, Annapurna and Fishtail Mountains. Visit Seti Gorge, David’s Fall, International Mountaineering Museum and Gupteswor Cave. Enjoy boating in Phewa Lake in the evening. Leave Pokhara and follow Prithvi Highway. Kathmandu is located 200km far from Pokhara. Enter Kathmandu from Thankot check post. Enjoy pleasant dinner and stay overnight in a hotel. You will be transferred to Airport 3hrs before your scheduled flight. We are happy to serve you. Hope to see you soon. Tips (Tipping is expected but not mandatory).